They’ll get a second chance at No. 3 Ohio State this weekend. It’s a lesson the Hoosiers (4-1, 1-1 Big Ten) should have learned last season when their inability to close out games cost them a bowl bid. This year, they’ve been better — but far from perfect. They hung on for wins at Florida International and against Virginia before pulling away from Ball State. Then, against the Spartans, they fell behind early, charged back late and the defense couldn’t get one last stop to give the ball back to the offense with a chance to force overtime or win the game. The Buckeyes (5-0, 2-0) lead the East Division after last weekend’s comeback at Penn State. With the win, and coach Urban Meyer back on the sideline, Ohio State appears to have one of the inside tracks to a playoff spot. 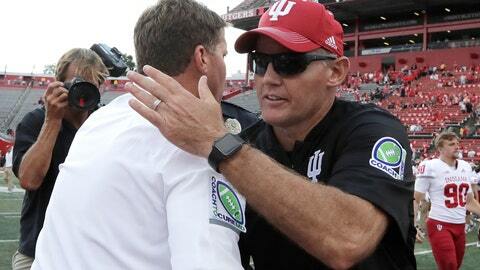 The Hoosiers haven’t been 5-1 since 2007, something that has only occurred three times in the past quarter-century. Ramsey returns to his home state and is expected to be flanked in the backfield by true freshmen Stevie Scott and Ronnie Walker Jr. The question is who will be catching Ramsey’s passes. Receivers Luke Timian and Whop Philyor, two of Ramsey’s top targets, missed last week’s game because of undisclosed injuries and it remains uncertain if they’ll play this week. “Hopefully we will be able to get a couple guys back that didn’t play Saturday. I really don’t know any of those yet,” Allen said. After losing seven of last season’s starters, Indiana ranks in the top half of the Big Ten in five categories — pass defense, third-down percentage defense, fourth-down percentage defense, turnover margin and pass efficiency defense.